Lois was a ballerina back in the 70's. Thanks to the greatness of one (not two) Josh Tauber, I have come to possess Superman #224. 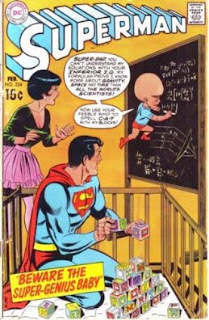 The issue is from 1970 and the second bronze age issue of Superman. Apparently Josh couldn't shell out an extra quarter for the first bronze age Superman comic book. Did I write greatness? I meant at least he's not dead. Anyway, the comic of the day is amazing. 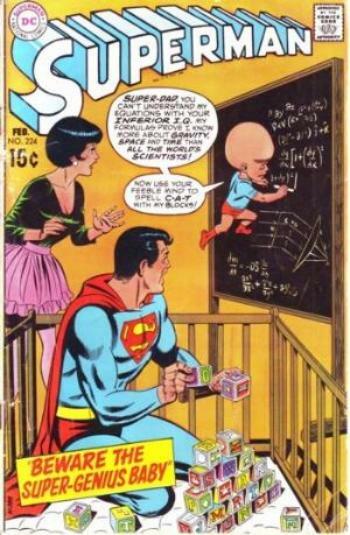 It tells a "you never know...it could happen" tale in which Superman marries Lois Lane and has a son. Unfortunately for Superman, a couple of his enemies, or as I like to improperly label them "enemi" (make actually be the term for more than one enema...which are much like tattoos...after you get one you can't stop getting them) manipulate his baby into becoming a super-smart kid who eventually talks back to Superman and begins to become evil. After a few pages Supes gets the upper hand, and by "upper" I mean the back of his hand, and returns his kid to normal the old fashion way (notice the child's swollen head from the abuse).